As the wind picks up and the sun sets earlier, I find myself clutching my post-punk records close to the chest. 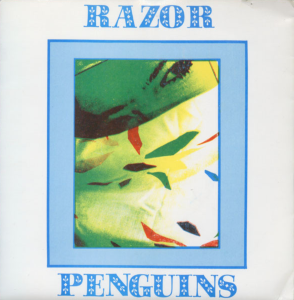 What better time than to post the full 7” discography by US goth/post-punk band Razor Penguins. 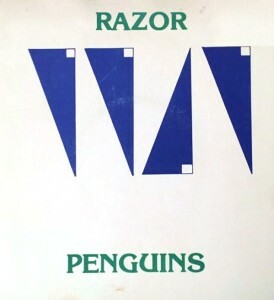 Though they sound inspired by both the UK scene as well as the budding LA “desert-goth” scene at the time, the band hailed from Columbus, Ohio. These two releases appeared with a five year gap in between, quite a long time to wait for a follow up… The first 7” is incredible, both tracks gloomy and incisive as ever. “Paris” sounds right at home with Lung Overcoat, another US band with a similarly UK-inspired sound. The flip is far gloomier, with a nasty churning guitar working its way throughout much of the backing track. The second 7” is a bit more of an instrumental affair, though their style hadn’t changed much in five years. The title track has a bit of spoken word vibe throughout, while the second song is a straight instrumental, akin to the likes of the recent Savage Republic reissues which stripped their otherwise classic material of vocals.